Two new DHW cylinders combine an A+ energy rating with high performance. Viessmann has introduced the only domestic hot water cylinders on the market with an A+ rating. The two new floorstanding Vitocell 300-V DHW cylinders, with capacities of 160 and 200 litres, are twice as energy efficiency in terms of standby losses as the industry norm. 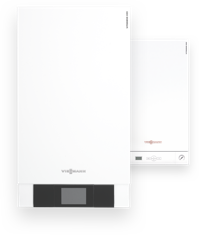 Both new versions of the Vitocell 300-V replace the previous A rated models, and both are suitable for domestic installations with boiler outputs up to 80 kW. Higher DHW demands can be accommodated by combining several Vitocell 300-V cylinders into cylinder banks with common headers. The 300-V’s exceptional heat retention is made possible by using a highly effective vacuum panel insulation as well as the very efficient Polyurethane hard foam. Heat losses are merely 0.7 kWh per 24 hours for the 160-litre model and 0.75 kWh per 24 hours for the 200-litre model. The new 300-V combines this unmatched energy efficiency with high performance. The indirect heating coil is larger than in most common cylinders and drawn all the way down to the cylinder floor to heat the entire water content. Heat-up time from 10 to 60 degrees is just 20 minutes for the 160-litre cylinder and 24 minutes for the 200-litre cylinder. The low pressure-drop of the heating coil, at only 15 millibars, is approximately 35% lower than a typical competitor cylinder. This negates the requirement for oversizing the circulating pump; specifying a smaller pump will save electricity. Maximum hot water flow rates are 24 and 34 litres per minute respectively. The 300-V’s insulation package can be removed for easy handling. Transportation and installation are also made easy by the 300-V’s low weight and compact dimensions. Both 300-Vs are 581 mm long and 605 mm wide, with the smaller-capacity model measuring 1189 mm in height and the larger-capacity model 1409 mm.